At our Kanata chiropractic office, we rely on x-rays (radiography) to diagnose your condition, develop an appropriate care plan, and track progress. But how much risk is there, really, from an x-ray? Here are seven reasons why you shouldn’t fear an x-ray, liberally edited from a great article on the subject by Paul A. Oakley and Deed E. Harrison. For decades, a safe level of radiation exposure was extrapolated using data from Japanese survivors of the atomic bombs in the Second World War. This method assumed that the danger from a given amount of exposure tracked in a straight line from a fatal level to a zero level. But this “linear no-threshold” (LNT) model has come under fire in recent years. Some of the very international organizations that once endorsed it are changing their tune, including the United Nations Scientific Committee on the Effects of Atomic Radiation and the US Nuclear Regulatory Commission. Why? Because it’s come to light that the original research was flawed and perhaps even deliberately misrepresented. A growing number of experts no longer consider LNT a reliable means for estimating cancer or other health risk from the occasional low-dose radiation exposure typical of an x-ray. 2. Low dose radiation may enhance health via the body’s natural adaptive response mechanisms – known as radiation hormesis. We talked last week about how the body responds to weight training – lifting weights breaks down muscle tissue at the cellular level. Your body responds by building that tissue back, stronger than before. Radiation hormesis is the same principle, except the breakdown is caused by low dose radiation rather than the burn from lifting weights. Your body also responds to this cellular damage by rebuilding the tissue stronger than before. But the key takeaway is not only is low-dose radiation exposure not dangerous, it may actually be beneficial. 3. A typical diagnostic X-ray only induces one-millionth the cellular damage as compared to breathing air for a day. Whether you believe low doses of radiation can actually be good for you, the key thing to bear in mind is just how small the dose of radiation is from a typical x-ray. Our bodies suffer cellular damage constantly. Our cells are damaged by the by-products they produce by doing what they are supposed to with the oxygen they need to function. These by-products are called reactive oxygen species (ROS). An example of an ROS with which you may be familiar is hydrogen peroxide – an oxidant and bleaching agent. It’s estimated that each cell in your body produces about 10 billion of these molecules per day through its regular biological function. An x-ray also produces ROS molecules—that’s what causes the cellular damage. But let’s put this in perspective. A typical x-ray only creates about 150 per cell. That’s not a typo – 150. Not even a drop in the bucket compared to 10 billion. 4. The radiation exposure from most x-rays is below what we are exposed to from the natural environment. Your body is constantly exposed to radiation. Radioactive materials occur naturally in soil, rock, water, and food. Cosmic rays hit us from outer space. What is the typical level of background radiation? Radiation exposure is measured in millisieverts (mSv). The average exposure worldwide is 2.4 mSv per year. Most x-rays we are likely to do in our chiropractic office contain only a fraction of that amount, as little as a tenth. The only way it may be as much is if we do a full imaging of your entire spine. And yes, that would mean a full year’s dose of background radiation … in one shot. If that scares you, it shouldn’t. There are parts of the world where the level of natural background radiation is 50, 60, even 80 times the average. Extensive study has shown no obvious ill-effects among the people who live there – no elevated cancer risk, or birth defects, or premature deaths. 5. Radiophobia stems from unwarranted fears and false beliefs. Thanks to what the Boomer Generation and their parents lived through with the Cold War and the fear of Nuclear Armageddon, it’s only to be expected that the very word “radiation” can inspire a knee-jerk reaction. As we said up top, for years, the medical community relied on the “linear no-threshold” (LNT) model for health risk from occasional low-dose radiation exposure. But this model is now being discredited. It’s another one for the history books, like the outdated idea that eating eggs is bad for you (which, really, for the average person, it isn’t). Reputable studies by top scientists have repeatedly shown that the low-dose radiation exposure typical of an x-ray does not result in a greater risk of cancer. 6. X-rays lead to better patient outcomes. We can’t fix what we haven’t measured. It may be a cliché, but it is true – a picture is worth a thousand words. 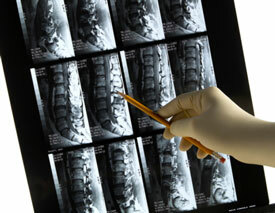 Nothing gives us better insight into the health of your spine than an x-ray. Do you really want us to start adjusting your spine, or that of your child, before we have a clear understanding of the problem? A series of x-rays is also the best way (aside from how you feel) to show progress and provide you with fact-based evidence that the care we have recommended is actually working. 7. The risk to benefit ratio is always in your favour from routine radiography. We do hope this is self-evident at this point. But if you have any other questions or concerns, our doors are always open.